Lights dimmed at UN Headquarters to observe Earth Hour in 2016. The United Nations this evening dimmed the lights at its iconic Headquarters complex in New York and other facilities around the world in observance of 'Earth Hour,' an annual global event to put the spotlight on the issues facing the planet and to inspire millions across the world to live more sustainably. Organized by the World Wildlife Fund (WWF), Earth Hour encourages individuals, companies, organizations and Governments to switch off their lights for one hour at 8:30 p.m., local time worldwide, to focus attention on people-driven solutions to protecting the planet and building a bright, sustainable future. First launched in 2007, Earth Hour has become an annual event, mobilizing hundreds of millions of individuals to participate and growing to become the world's largest grassroots movement for the environment. According to the WWF, the UN family will join the thousands of homes, offices, skylines and monuments that will go dark to put the spotlight on the issues facing the planet, and to inspire millions across the world to live more sustainably. At least 178 countries and territories are expected to take part in this year's celebrations. So far over 366 landmarks are confirmed and will be turning off on the night of Earth Hour including iconic sites such as the Brandenburg Gate, Empire State Building, Sydney Opera House, the Roman Colosseum and Marina Bay Sands. Amongst participating countries this year 90 are taking actions to achieve impact during Earth Hour through digital interactions, engaging local communities and raising awareness, adds the WWF. 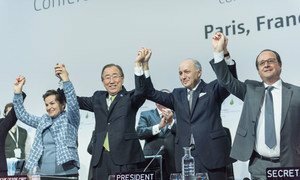 While the international community has provided a solid foundation for the world's response to climate change by adopting the Paris Agreement this past December, United Nations Secretary-General Ban Ki-moon said today that it is now necessary to build on that momentum in order to secure a safer and healthier future for all.